New entrant Kia Motors, the world’s 8th biggest South Korean car maker by sales, is charting out a strategic game plan to be the fifth largest car maker in India within three years. The new brand would take on market leader Maruti Suzuki, its own sister brand South Korean Hyundai, India’s second largest car maker, Mahindra, Tata Motors and Honda. The automaker, which is ready to roll out its first car in India before Diwali next year, is also contemplating an India-specific electric vehicle to be part of its line-up to take on rivals in the fiercely competitive car market in the country. These cars will be produced at its new upcoming $1.1 billion or Rs 7,700 crore factory at Anantpur in Andra Pradesh. It has an installed capacity to roll out 3 lakh cars every year. It would start commercial production in September next year. Kia Motors has an ambitious plan and growth trajectory too to introduce six new cars for the Indian price conscious market over the next three years, which means a new car model every six months for the home market. The first Kia car for the Indian market would be based on the SP Concept, a mid-size sports utility vehicle showcased at the Auto Expo 2018. Manufactured at its Anantpur factory, it would be launched before Diwali next year both in petrol and diesel engines. “We will launch one new car every sixth months, starting from mid-2019 to coincide with the Diwali festive season in India,” Manohar Bhat, head, marketing and sales at Kia Motors India told Financial Chronicle. S-Cross,” he pointed out. But it would also challenge its own sister brand Hyundai’s popular Creta and the upcoming Nissan Kicks SUV on the Indian roads. It would also launch a sub-four meter compact SUV, a multi-purpose vehicle and also a premium SUV measuring more than 4.5 meter in length, Bhat said without revealing more details. “Kia has a huge product portfolio and we will take a decision to line-up different models depending on the demand in India,” he pointed out. But it ambitious growth trajectory in India is clear. “We are targeting to be among top five players in three years in India. We are also looking to position ourselves as a premium brand in the mass segment,” Bhat said. The company is not considering the compact cars segment which accounts for about 70 per cent of the total Indian passenger vehicles segment that stood at around 3.3 million units in 2017-18. “We want to position ourselves as a premium brand. At the moment there is no plan for compact cars in India,” Kookhyun Shim, CEO and managing director at Kia Motors, said. However, whenever it wants some volume support, it would line-up compact cars for growth, he pointed out. Interestingly, this is the first time that a global car brand is developing an electric vehicle specifically for the Indian market. Several other automakers have developed electric vehicles but for the international markets. For instance, Hyundai is bringing to India next year its global electric SUV Kona while the British iconic brand MG Motor, now owned by Chinese biggest brand SAIC Motor, has promised to launch an e-SUV in 2020. Japanese brands such as Suzuki and Toyota are also working on a global solution together. French car giant Renault too is planning to bring in an electric Kwid that is to be launched in China. Kia Motors is looking to launch its first electric vehicle in India in 2021. The company has a development centre in Hyderabad on the lines of the Renault-Nissan development centre. “We will have a dealership footprint like nobody else who had started off in India,” Yong S Kim, executive director, sales & marketing at Kia Motors India, said. “The dealership expansion will be quite different, I promise you. We are expecting the Indian car market to hit 4.5 million units in the next three years. By that time we should be able to roll out 3 lakh cars from our new factory in India every year,” he said confidently. Kia Motors gifted three brand new imported electrified vehicles to the Andhra Pradesh government for trial runs. 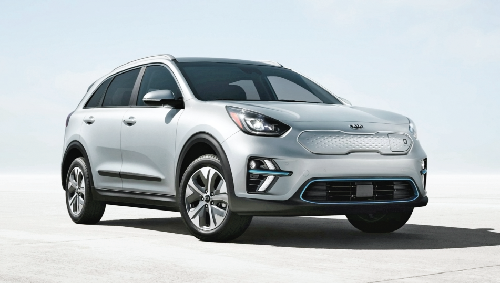 Three different versions of the Kia Niro -- a Niro Hybrid, Niro Plug-in Hybrid and a Niro EV-- will be used by state government officials at its secretariat in Amravati. In fact, Andhra Pradesh aims to become the first state to run 10 lakh electric vehicles by 2023 and attract investments of Rs 30,000 crore by electric vehicle and charging station companies. The company is also installing a vehicle charging station at Vijayawada for representatives from the regional government to charge their new environmentally-friendly fleet. Andhra Pradesh is developing 14 smart cities and Kia is working with the state government to design a new generation of transportation system that best serve the citizens in each of these cities.